An enhanced income fund sells options to boost the income of an equity fund that tracks a stock index. The drawback is that if the price of the index increases sharply you will receive a lower return than the index. Enhanced income funds sacrifice long-term capital gain for higher income. How well do they work, which funds offer enhanced income and how much do they cost? What Environments Favour Enhanced Yield Funds? 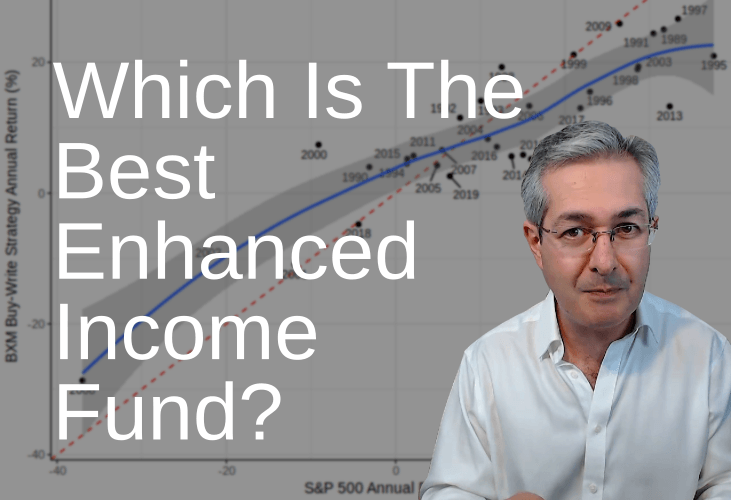 Do Enhanced Income Funds Work? This is not to be considered a recommendation to buy or sell. This material is intended to be for information purposes only and is not intended as promotional material in any respect. The material is not intended as an offer or solicitation for the purchase or sale of any financial instrument. The material is not intended to provide and should not be relied on for accounting, legal or tax advice, or investment recommendations. Reliance should not be placed on the views and information in this document when taking individual investment and/or strategic decisions. Past performance is not a guide to future performance and may not be repeated. The value of investments and the income from them may go down as well as up and investors may not get back the amounts originally invested. Share prices have the wonderful property of drifting upwards over the long-term and this capital growth is not capped, it can carry rising forever. Unfortunately, share prices tend to cavort wildly up and down en route to higher values which is an unpleasant attribute called volatility. The unlimited upside for shares is the primary reason why investors are willing to put up with their volatility. For those who want a more sedate rate of capital growth which will let them sleep better at night bonds are usually less volatile but have a fixed upside, hence their description as "fixed income" products. What if you don't think share prices are going to rise much over, say, the next few years? The reason could be the beginnings of a recession, or a rally that you think is getting a bit overstretched. In this case you may be willing to forgo the upside, which you don't believe in anyway. If so you might prefer to sell this upside to someone else, who evidently does believe shares will rally, and use the proceeds to boost your income? This is precisely how enhanced yield funds work. They take some equity index, such as the FTSE 100, and track it. However, at the same time as owning the index they sell "call" options which contain the rights to buy the index upside above some fixed level. In the graph below the blue line shows the profit and loss for a simple fund that passively tracks the S&P 500. It gains and loses one-for-one as the S&P 500 rises and falls. The red line shows the profit and loss of a buy-write strategy on the S&P 500. The line is shifted upward because we have sold an option which paid us the value of that option (called the option premium) boosting our profit. The price we have paid is to cap our upside, which we have sold to another investor. If the S&P 500 surges upwards in value we would have been better off owning the passive tracker. If the S&P 500 stays below the breakeven where the red and blue lines cross then we are better off with the buy-write strategy. Because enhanced yield funds use options discussions about them usually involves some option language. So here are some keywords that you can use as a reference. Yield: This refers to dividend yield. If you buy a stock for £100 and it pays you a cash dividend of £5 per year the yield is £5 / £100 expressed as a percentage, or 5%. Option: The write to buy (call option) or sell (put option) something at a fixed price (the strike price) at a fixed time in the future (the expiry date). Premium: The money you make for selling or pay for buying an option. Volatility: The typical daily price movement of a stock or bond, expressed as a percentage. More volatility means more risk. Writing An Option: Selling an option to someone else for cash today. This incurs risk that you will have to pay out cash at the expiry date to the option buyer. Buy-Write: A strategy where you buy a stock and simultaneously sell an option on that stock which alters your upside, downside and risk but generates income from the option. Covered Call: You buy a stock and simultaneously sell a call option on that stock. This caps your upside but pays you the premium for the option. The most important factor which is not under the control of the enhanced yield fund manager is volatility. Buy-write strategies underperform when stocks are rising strongly, as they did in 2017, volatility tends to be extremely low. This makes the call options sold by the fund cheaper and reduces the yield enhancement of the ETF. The fund manager has some leeway to boost the option premium by lowering the strike price or putting the expiry date further in the future but both of these reduce the potential for upside. The ideal environment for enhanced yield funds is when the stock index is very volatile and oscillating around a fixed level, or "moving sideways" in investment lingo. High volatility means the yield enhancement is larger and the index not rising too much means the fund investors are not missing out on upside and profiting from capital gain. The CBOE S&P 500 BuyWrite Index (the “BXMSM” or the “BXM Index”) measures the total rate of return of a hypothetical “covered call” strategy applied to the S&P 500 Composite Price Index® (the “S&P 500® Index”). 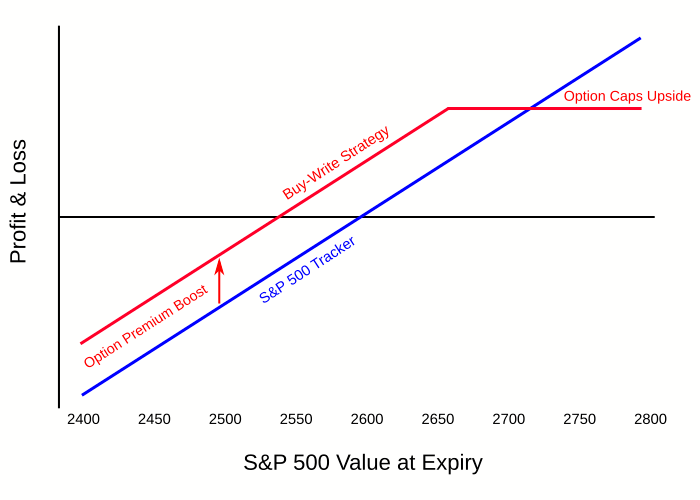 This strategy, which we refer to as the “BXM covered call strategy,” consists of a hypothetical portfolio consisting of a “long” position indexed to the S&P 500 Index on which are deemed sold a succession of one-month, at-the-money call options on the S&P 500 Index listed on the Chicago Board Options Exchange (CBOE). We refer to this hypothetical portfolio as the “covered S&P 500 Index portfolio.” The BXM Index provides a benchmark measure of the total return performance of this hypothetical portfolio. Dividends paid on the component stocks underlying the S&P 500 Index and the dollar value of option premium deemed received from the sold call options are functionally “re-invested” in the covered S&P 500 Index portfolio. The BXM Index is based on the cumulative gross rate of return of the covered S&P 500 Index portfolio since the inception of the BXM Index on June 30, 1986, when it was set to an initial value of 92.211 . We can compare the BXM index with the S&P 500. We have to be careful to compare like with like. Both are total return indices, which means they re-invest any dividends back into the index reflecting the long-term income boost that is what enhanced income funds are all about. The S&P 500 total return index data begins in 1988 so this is where the comparison begins. 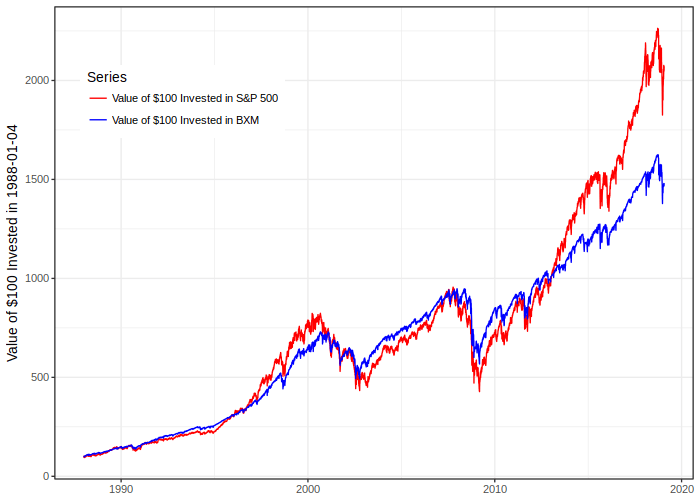 If we plot the value of $100 invested in 1988 it is clear that the S&P 500 (red) performs better than BXM (blue) overall. However, there were periods where the BXM was ahead such as from 2002 to 2013. If we plot annual total returns of the S&P 500 and BXM it becomes clear when the BXM is preferable to the S&P 500. The dashed red line is where the points would lie if the S&P 500 return was equal to the BXM return. 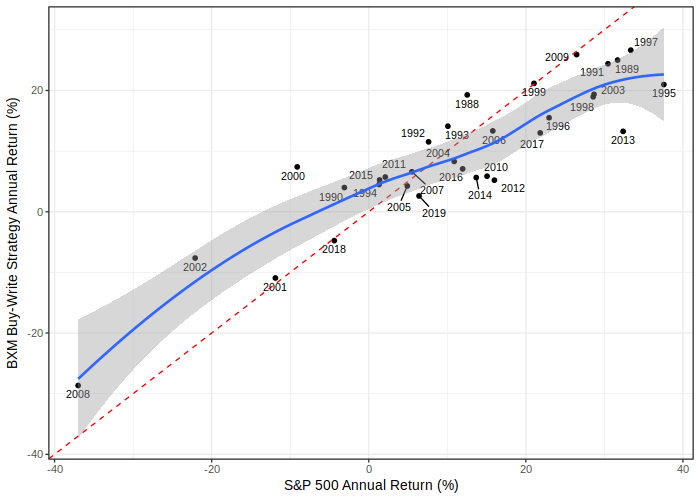 Returns for BXM lag S&P 500 return most when returns are strong to the right hand side of the graph, such as in 2017, 1997 and 1995. When the S&P 500 has poor returns, on the left of the graph, BXM outperforms the S&P 500 such as in 2008, 2002 and 2000. This fits with our intuition that selling the upside will damage BXM's performance most during strong rallies as it has sold some of the S&P 500 upside. In contrast, when the S&P 500 is falling or staying at the same level selling upside boosts the total return of BXM above that of the S&P 500. QYLD: Global X NASDAQ 100 Covered Call ETF. This gives exposure to US technology stocks in the Nasdaq 100 index while boosting the dividend by continually selling upside on the index. The fund total expense ratio is 0.6%. PBP: Invesco S&P 500 BuyWrite ETF tracks the BXM index described above. The fund's total expense ratio is 0.49%. PUTW: WisdomTree CBOE S&P 500 PutWrite Strategy Fund tracks the CBOE PutWrite index. This invests cash in very safe US government bonds but sells downside insurance on the S&P 500 called "put" options. This means investors have all the downside exposure of the S&P 500 with none of the upside but continually earn the option premium. The fund total expense ratio is 0.44%. Fidelity Enhanced Income: This is a UK equity income fund where the manager sells calls on subset of FTSE 100 stocks to boost the fund income. There is an income share class version of the fund with an ongoing fee of 1.67% and an accumulation share class with a fee of 1.66%. Fidelity Global Enhanced Income: This invests in global equities with an income share class (fee 1.68%) and an accumulation share class (fee 0.94%). RWC Enhanced Income Fund: Invests primarily in UK shares. The ongoing fees for the income share classes are 1.16% for 'R', 1.15% for 'B' and 1.91% for 'A'. For the accumulation share classes the fees are 1.16% for 'R', 1.11% for 'B' and 1.89% for 'A'. BMO Enhanced Income UK Equity / EUR Equity / US Equity: There are three ETFs offered by BMO which focus on yield-enhanced versions of equity markets from these three regions. What is notable about these funds is their comparatively low fee, which is 0.3% for all three funds. Santander Enhanced Income Portfolio: The fund buys mostly UK shares and sells call options to boost income. Upside is kept for some stocks so there is scope for capital growth from the fund. The ongoing fees are 0.57% for share classes 'IA' and 'II' and 0.72% for 'RI' and 'XI'. Liontrust European Enhanced Income Fund: Invests in European equity and targets a dividend yield of 1.25 times that of the MSCI Europe ex-UK Index. Fee is 1.68%. What is surprising is the high level of fees for these funds with the exception of the three from BMO. The reasoning, which is flawed in my opinion, seems to be that customers will not mind paying a high fee if the fund offers a high income. While high fees for high income might have been acceptable ten years ago, it is no longer acceptable today. These days active fund managers have to show their added value alongside passive funds that cost as little as 0.1% or even zero management fee. Yield enhancement is not rocket science and should not command a rocket-science fee. When choosing one of these funds you should consider firstly which equity market you like, because you will be exposed to the risk of that market. Then consider what the fees are for the available funds for that market. Another consideration might be the fund manager e.g. do they have a good track record and do they sound like their investment approach is sensible? Another consideration is whether you think we are entering a period where your chosen market will rally strongly or have low volatility as either of these would mean option selling strategies would not fare well. But, most important of all, don't buy something you don't understand.